Last week, Snack Girl bumped this post with beef jerky to celebrate being put on a list of GREATEST. I received many e-mails from upset readers. I didn't forget you - beef jerky enthusiasts! And, if you aren't enthusiastic about beef jerky - I don't blame you. The "Slim Jim" in your local 7-Eleven is a poor substitute for beef jerky. 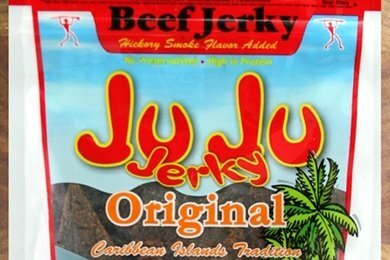 Ju Ju Jerky has no MSG or preservatives, is low sodium, and high protein. It also has a moist texture which makes it much more palatable than the RUBBER of most commercial beef jerkys. You can buy a range of Ju Ju Jerky products on their website - Ju Ju Jerky Store and on Amazon.com. They have both beef jerky and turkey jerky and SPICY jerky (which is my favorite). Are you looking for sparkling without the alcoholic side effects? Well, Knudsen has come out with these adorable cucumber sparkly waters for those of us trying to keep a lid on our holiday champagne consumption. These little guys are so cute, festive, and refreshing. Snack Girl has a recipe for cucumber/orange water for the summer months. These "sparkling essences" are a lot more dressed up. The flavors include lemon, mint, blueberry, coconut, lime and cucumber and they are zero calories - no added sugar or artificial sweeteners (or Stevia). They retail for $3.99 for 4 and they can be found here: Knudsen Store Locator or on Amazon.com (below). The Healthy Gourmets are two nutritionists who CARE about snacks. They have written a short book called "Munch, Yum, Grow!" to support parents and childcare workers with innovative snack ideas. The book includes snack advice, 25 kid-tested snack recipes and has nut-free, gluten-free, and lactose-free options. This is a great guide to have around when lacking in snack inspiration. Munch, Yum, Grow! Healthy Snacks for Kids "On the Go"
It is a little misleading when companies say that "their" beef jerky is high in protein. ALL beef jerky is high in protein - unless there is something tragically wrong with it. Just an fyi, the R.W. Knudsen product locator doesn't always provide accurate results. I know for a fact that my local grocery stores carry R.W. Knudsen products (because that's where I purchase them) but the locator says no stores within 50 miles of me stock those products. I recently had a delicious vegan jerky, Primal Strips, that was out of this world. It had the same chewy satisfying texture without the meat. They're made by Primal Spirit Foods. Try the Mequite Lime. Yum. WHY OH WHY DOES ALL BEEF JERKY HAVE TO HAVE SUGAR IN IT!!!!!! SO dang annoying cause I love jerky so much!